In my prior post, I asked how Christians should respond to the claim of Secular Humanism, embedded in the title of the popular book, Good Without God, by Harvard/MIT Humanist Chaplain Greg Epstein. In the book Epstein names some famous figures who he claims were fellow Humanists, including Thomas Jefferson, Winston Churchill, Jean-Paul Sartre, and John Lennon. What they all had in common was a commitment to the highest human ideals of compassion, dignity, and service to others – absent any support from God or religion. 1. More power to them. I find myself in support of Humanism for its positive contributions to the common good of society and its rejection of the harsher forms of atheism seen in the last twenty years. And Jesus teaches that God causes the sun to rise on the evil and the good, and sends rain on the righteous and the unrighteous. The upshot of common grace is that even in a fallen world God provides the resources for humanity to function at a certain level of proficiency. Hence the relative success of Humanists. 3. Image of God preserved. Though fallen, human beings are still made in God’s image and thus retain a vestige of God’s goodness in their lives and are capable of virtue in some measure. What critique might be made of Humanism? I’ll share mine in the next post. Well, that’s making a rather large and unwarranted leap as the second does not follow necessarily from the first. I’ve also found that the concept of “common grace” is not something most humanists have ever heard of, let alone considered or understood. Is this something you’ve encountered as well, or are you finding most humanists understanding – but rejecting – the concept? Ron, thanks for your comment. I agree: if a natural phenomenon such as orbits of planets can be explained scientifically, the explanation doesn’t rule out God. A scientific explanation is often compatible with both naturalism and theism. Secondly, I’m not seeing the unwarranted leap that you mention. 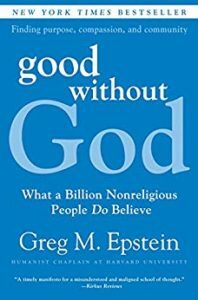 “We can be good without believing in God, therefore we don’t need God in order to be good.” The conclusion does seem to follow from the premise. But perhaps I’m missing something you have in mind there. Common grace: It’s not a well-known concept, though well-read ex-Christians turned humanist will have heard of it. Once I explain common grace to humanists, however, they tend to reject the concept, falling back on their underlying naturalism instead. Of course, common grace is real only if Christian theism is true, which is the critical question.